In the February 2019 issue of Latitude 38, page 28, the first entry is a letter from an experienced cruiser with questions about getting certified to charter in the Mediterranean. This is all about the question of what credentials are needed to charter in the Med. It’s a real issue, and we can resolve it. I had to respond. Here’s the letter. Responding to Cary and Michele Hansen looking for the easiest way to get their Mediterranean sailing license, the NauticEd SLC route is the quickest, easiest, and least expensive in most cases. Cary and Michele can do the practical on-the-water assessment for the SLC with me in one day in Long Beach. I run Santana Sailing in Long Beach, and we're a NauticEd school. The one-day assessment is an extensive pass/fail evaluation of essential skills, including Med-mooring with an anchor off the bow. And if they need some practice, a day of on-the-water training before the assessment will help knock the rust off. There's more to it including documenting sea time, completing on-line course requirements, and knowledge testing which will take some real time on the computer, but a sailor with the skills can knock out the practical portion for the SLC in a day. With US Sailing or ASA on the other hand, if they don't already have Bareboat Cruising or ASA 104, they do indeed have to start at the bottom with all the basic on-the-water courses. Contact Grant Headifen of NauticEd for more: grant@nauticed.org; +1 512-696-1070. To me, it's the grand unification theory in practice - you can use your skills to pass the practical assessment no matter where you got them, without having to start all over again at the bottom of some other system. That's a beautiful thing. I hope they post it! In the years following my first sailing lesson at age 14, I often found myself wondering what it was like to do the things I saw other sailors doing. As a teenager I saw Hobie Cat sailors one windy afternoon on Lake Mojave, flying a hull and capsizing, and then righting the cat and taking off again. How did they do that? In college I saw Laser sailors practicing roll tacks on Mission Bay, and I walked by a Hobie 16 skipper with his cat tipped over on the beach, adjusting the mainsail battens to change the sail’s shape. Why were they doing that? 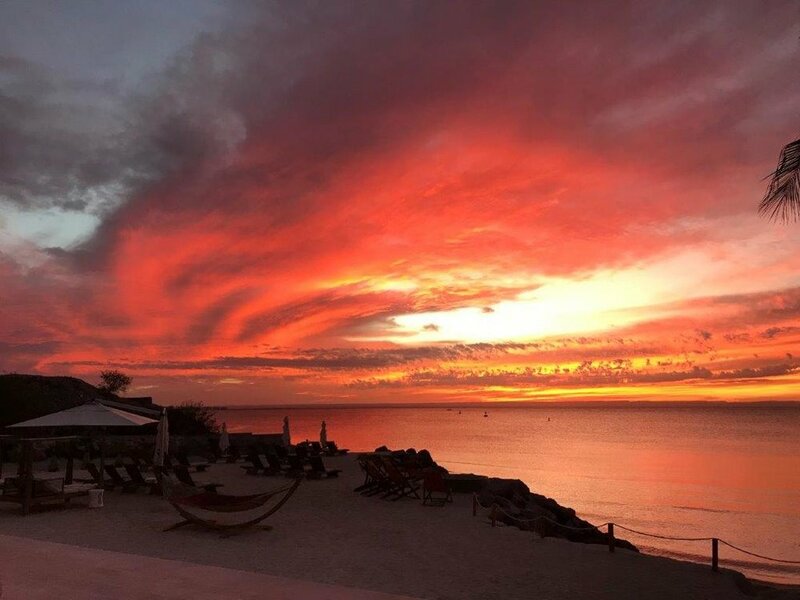 On vacation I saw cruising boats at anchor in the bay at Cabo San Lucas and thought, what does that take, and how can I do something like that? Over the years I learned by reading, asking questions, and through my own trial and error. But you will need so much more, unless you have an extra decade and a few extra lives to survive the mistakes. You need outside help to make the great leap forward. It happened for me in the mid to late ‘90s with three fundamental lessons that came from a deeply experienced sailor who had been where I wanted to go, and knew what I needed to know. Mark Howe of Aventura Sailing Association in Dana Point was my original instructor-mentor, and I have him to thank for these. Third, I had a heavy weather experience at Santa Cruz Island that showed me some things about boat handling and decision making. We had a double reefed main and a full genoa, and were hard on the wind from Ventura to the Scorpion anchorage. When we went to reef the genoa, we had to ease the sheet so we could roll it in part way, and the sail began to flog. Within about 10 seconds, the sail just exploded, having split at the seams about half way up. We rolled in as much of it as we could, and anchored near Smugglers while Mark weighed the options. He decided we should sail back to Ventura, and we did so on a double reefed main alone, making 6-7 knots the whole way. Another cruisier in the harbor came over to talk to us, and ended up loaning us a spare headsail from his own boat. I learned that sails have to be handled with care in heavy conditions, and sometimes you just have to head back to the harbor. And, that other cruisers can be generous people. That was part of my foundation for being able to handle my first strong gale in the Northern Channel Islands as an instructor - see the video below. I’ve been through a few of these now and while I don’t go looking for trouble, I love to teach the required techniques when the wind pipes up. The final lesson is that even after all the reading, talking to others, and trial and error chartering on your own, the best way to become a better sailor is to get out on the water with someone who knows what you want to know, who’s been where you want to go, and can answer questions you didn’t know enough to ask. 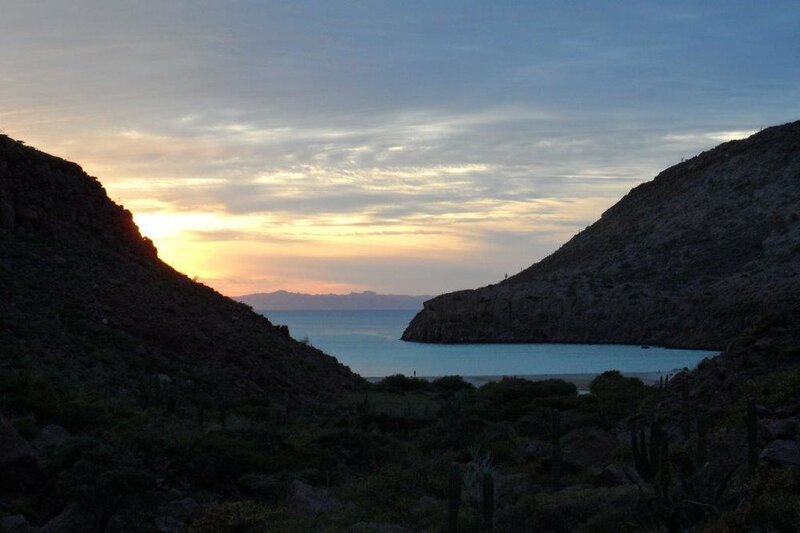 Why the Sea of Cortez? Imagine yourself leading family and friends on a week-long charter on a new Lagoon 450 catamaran. You can do this because you’ve achieved your Bareboat Charter Master Certification and Catamaran Endorsement, having gotten your training in these same waters with Santana Sailing. Now, this boat is yours for the week. The air is warm as you depart the marina, and your guests share a bit of excitement with you as a Manta Ray leaps out of the water with great flapping wings. Your guests don’t know the area but have heard about it, and you feel confident in the training you’ve received. It’s the Sea of Cortez. You could sail anywhere in the world, but you’ve come to this place. With warm water, uncrowded anchorages and abundant sea life, The Sea has attracted luminaries like Scuba Pioneer Jacques Cousteau, author John Steinbeck, and legendary cruisers Lin and Larry Pardey, all of whom spent significant time in and on these waters. 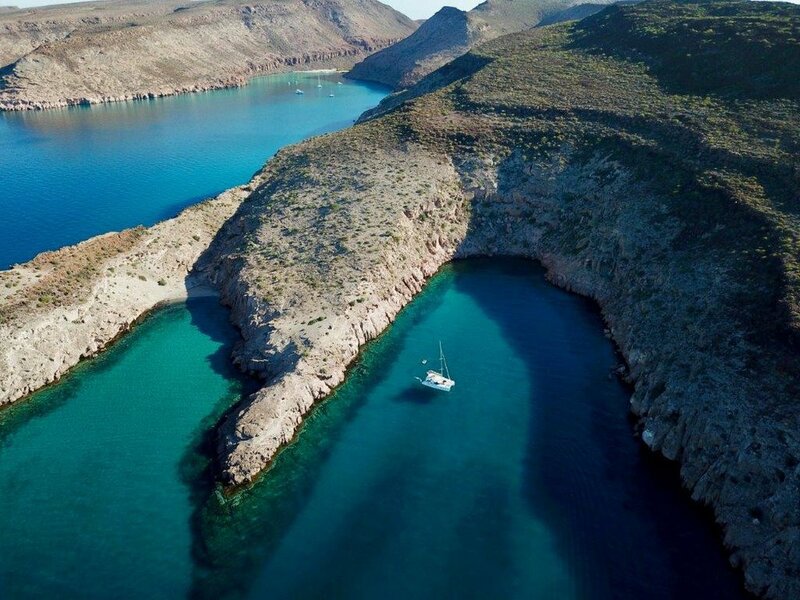 The Sea of Cortez is a completely different and fresh experience from the Caribbean or Mediterranean. No crowds, no boat boys, few tourists, no race to the next mooring field – just stunning scenery, a good sailing breeze, and a chance for solitude. You can also get your International Sailing License (SLC) and/or Bareboat Charter Master training and assessment completed during the week with Santana Sailing. 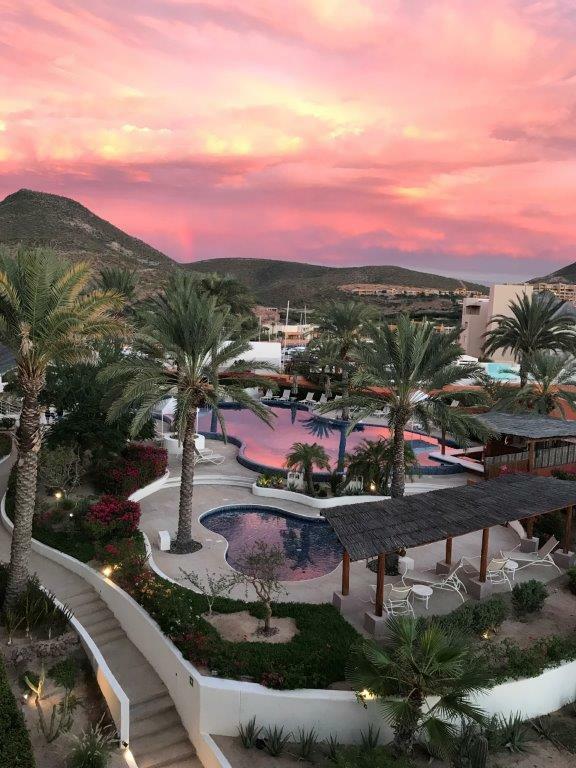 And, it is very easy to get there – a 2h 30m flight will bring you from LAX to Cabo. Frequently the sunsets are so amazing that the conversation just stops. And when you wake up to the sound of bare feet pattering on deck with hushed oohs and ahhhs, get out of bed and grab your camera. Contact us to learn more about Instructional Cruises and Slow Cruises on The Sea. Scroll down for a gallery of un-retouched sunsets and sunrises. Water in the Diesel - Ooops! Which Deck Plate is That? This might happen to you one day. I’m glad in retrospect that it happened to me, and right at the start of a trip I was leading. That’s because this is how it always happens - at exactly the wrong time, and it has to be fixed right now! I never would have set this up as an instructional opportunity on purpose, but it worked very well that way. The start of the trouble was simple enough. We were prepping the Catalina 42 Betty for departure, and I asked a crew member to top-off all the water tanks. There are a series of deck plates on Betty. 4 of them are for filling the water tanks, 2 for pumping out black water in the holding tanks , and one for filling the diesel fuel tank. As you can imagine, our crew member was mortified when red diesel fuel came spurting up out of what she thought was the starboard aft water tank deck fill. When she realize what happened and came to tell me, she looked like she felt she had sunk the boat, and our trip. It turns out that though time consuming, the fix is actually very straightforward. Click on the thumbnail below to play the video segment and see how we fixed it. Get ready with a plastic bottle, and start the engine. Don’t let the water fill the bowl to the top! Engine off, drain, and repeat. Dispose of the waste fuel-water properly. It took about 2 hours to drain about a gallon of water. We left for our Anchoring At Catalina weekend, kept checking the bowl in the Racor fuel-water separator, and drained a little more water after each time we had the engine on. At the end of the 3-day trip, we had all but a tiny fraction of it out. That was a great outcome, and a real test of how well the fuel-water separator works. What happens after you change that shredded impeller? Clean out the heat exchanger! If you read my last guest blog, you’ll remember that I was over the moon about being able to change the oil on our 1989 Catalina (Universal 25 XP). Well, that was one of the easy jobs! A few weeks back as we were motoring back into the harbor after a delicious sail off Long Beach, I glanced at the engine temp gauge and noticed it was 240 degrees. Yep, panic set in and I quickly shut her down! Impeller after…where’d those pieces go? Most likely culprit? 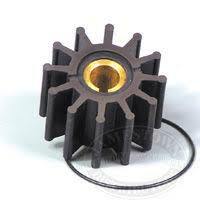 The impeller. Marc successfully showed me how to replace the impeller (we always keep spare parts on board) and then we knew we were going to have to get to the heat exchanger! Project for another day! Of course, the “another day” arrived and armed again with my favorite site on maintenance for our Catalina 34’ (www.realitycheck.me) we prepared for a BIG project. Thanks again to Steve and Rebecca for such great explanations, instructions and photos! One of the first steps was getting all of the coolant out of the engine. Once that was done, it was safe to remove the heat exchanger. We replaced a couple of hoses at the same time though it probably wasn’t necessary. I knew I would need new gaskets for the ends of the heat exchanger and they were readily available from Catalina Direct. I was so curious to see what would be in the heat exchanger!! Indeed, we found a good chunk of the pencil zinc anode that had broken off and lots of pieces of impeller! After cleaning out the HX, I flew into artistic mode with a burgundy scotch bright pad, scrubbing all the corrosion off the end caps til they were as shiny as a brand new penny! I cleaned up the heat exchanger by using a wire brush as per Steve’s advice then, the really fun part, I painted the heat exchanger Old Ford Blue! It looks beautiful! Put the gaskets on the end caps, sealed everything up and Marc and I worked together to clamp the heat exchanger and hoses back on. We filled the coolant and started the engine…. Oh no!! Overheating! We tried a couple of things, when my brilliant Captain thought there might be an airlock where we previously had the water heater. That was the ticket! We released the air (burp!) from that and we were in business! It’s so important to get that heat exchanger off and cleaned out if you have lost a zinc or have bits of impeller that have broken off. While it was challenging and an almost all day project for us, being the first time, when we have to do it again, it will be so much easier! Can she change the oil? Yes, she can! I’m a boat owner. So, I am either going to learn how to do some basic maintenance myself or rob a bank to have a professional do it. Since I don’t look so good in black masks, I decided to give it a shot with my Captain standing by to help. It never hurts to have some muscles in the vicinity! Armed with wonderful step by step instructions on how to change the oil on the Universal M25 XP (thank you Steve and Rebecca of Reality Check I had my list and my supplies ready to go! What made this job easy was having the right tools on hand! We have the oil collector from West Marine, a container to put the old oil to dispose of properly, and probably the most important item was having the adjustable wrench to get the old oil filter off! This was an exciting moment for me because being successful in maintenance on the boat is so fulfilling and I love learning the skills associated with boat ownership. After successfully changing the oil filter and putting new oil in, it was time to discover where the pencil anode for the heat exchanger was and also how to get the transmission bolt out to check the transmission oil. Now, for you ole’ salts this may seem like some pretty basic stuff, but for a woman who is fairly new to sailing and boat ownership, this is huge accomplishment. The Captain is pretty darn happy too! How nice to be able to have your partner enthusiastically help with simple boat maintenance. I am of the thought that staying on top of things like changing pencil anodes, oil, fuel filters, etc., will definitely help avoid unnecessary problems. I have created a maintenance log for all areas of the boat that need to be checked on a monthly basis as well as things needing attention biannually, from the engine, to the deck, to the rigging, to the cabin. While there will undoubtedly be some issues that will require outside help, I am excited to be able to do general maintenance, give our girl some TLC and to learn more about her working parts! It’s taken some time to study and figure out exactly what parts to order, but every day I am growing in knowledge and that is cool, yet, still so much to learn. Next projects? Taking off the heat exchanger, changing the fuel filter, buffing and waxing the hull – And then maybe a full body massage! Sail the Amalfi Coast of Italy? Certo! Okay, I am going to tell you right off the bat, I lived in Italy for 12 years so I am totally prejudiced. I LOVE ITALY! I love the food, the people, the scenery and yet, this past July was my very first time sailing there! On this Sailing Adventure we charted a Jeanneau 519, brand new, with 5 cabins and 2 heads. (Yes, there were a few of us aboard!) We were part of a flotilla with NauticEd that was well organized by Grant and Lauren! 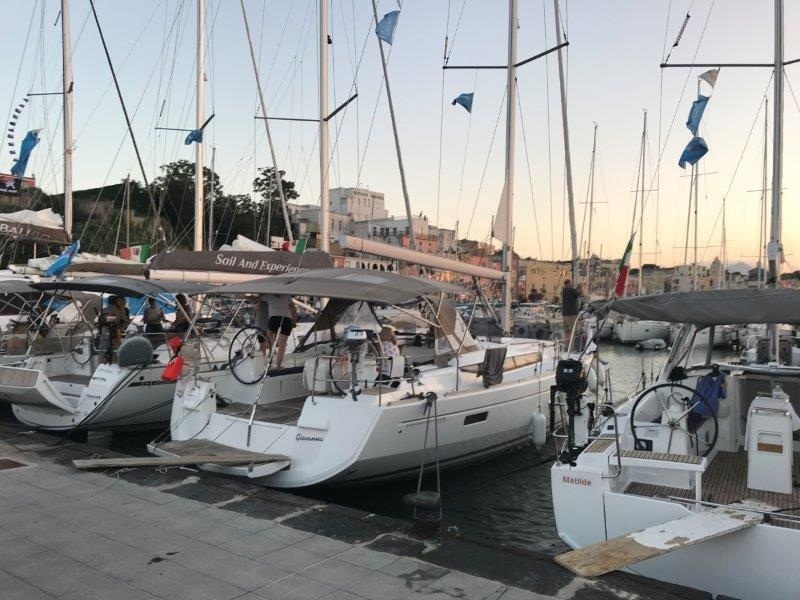 We had a fun dinner together and the next morning all 60 sailors (not all on our boat obviously) departed Salerno, free to follow their own itinerary or the flotilla’s suggested stops. Around lunch time we anchored for a bit at the green grotto, jumped in for a dip and a swim into the cave! Rolly, rolly, rolly! My best friend who had come from Bari, Italy to cook for us succumbed immediately to nausea and dripping sweat. How my heart broke for her. So, we sailed on to Positano. Lovely Positano! And it is! From the land! We’d reserved a mooring ball and you won’t believe it! Rolly, rolly, rolly!!! In addition, you’ve probably heard of the Italians’ reputation for driving! Well, they drive their boats the same! What? A 5 mph no wake zone? NO WAY! Doesn’t exist! So, between the ferries coming in from the islands of Capri, Procida and Ischia and the skiffs zooming along…. Did I mention that it was rolly? I think it was the most miserable time I’ve ever spent at anchor but this is the life of the sailor. Some good nights at anchor and some rough nights. Ahhh, but then the sun set, the temperature cooled off and the lights of Positano began to glow and wow, what a sight! Of course, we were none too soon to get underway the next morning along with the rest of the flotilla. We ventured on to Ischia, a beautiful, beautiful island, lovely marina. 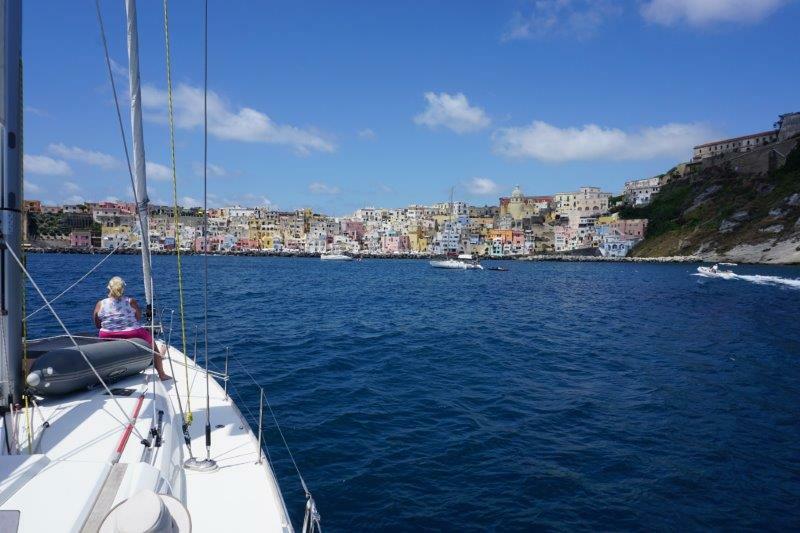 After spending the night in Ischia (at Marina Aragonese in Casamicciola) we sailed on to nearby Procida (Marina Procida) checking out some of the fabulous picturesque towns and medieval castles from the water. From there, on to Capri. Sailing was lovely. Good breezes and good company! If you plan to sail the Phlegraean Islands of Italy there are a couple of things to be aware of. The marina prices are high. Reservations for slips or moorings are very important and to be made well in advance! 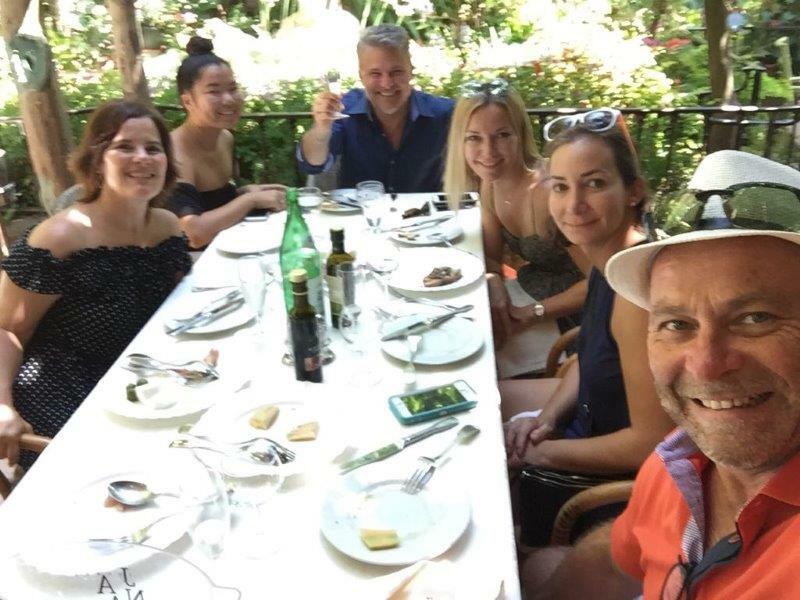 On average, we paid $130 USD per night for a slip and should one decide to go Marina Grande on the north side of Capri to hang out with the rich and famous, get ready to knock out up to $2,700 per NIGHT! (Okay, monohulls are only charged about $300 USD) So, not wanting to take up any slip space from Beyonce and Jay Z, we decided to sacrifice and anchor at Marina Piccola on the south side of Capri. And you’ll never guess! Rolly! Another concern when anchoring out is that you may not be able to take your own dinghy to shore! There often are no dinghy docks, nor permission to leave your dinghy. If you are moored, there are shore rides available but we had trouble discerning what we were able to do at Capri. So, our crew pretty much decided to hit the road (hit the sea?) and head back to Amalfi where we got a slip in the marina. 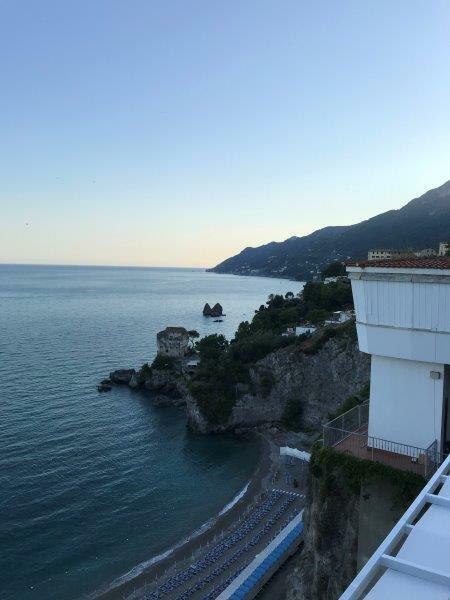 It was a good choice as it gave us extra time to explore the historic town of Amalfi, eat lots of gelato, drink Rucolino and Limoncello, and of course, eat PIZZA!!!! Lots of pizza! I think cruising this area of Italy is much more about getting to your destination, shorter sailing from place to place, exploring on land and eating wonderful dinners ashore! You can expect rolly anchorages as much of them are very open and offer little protection. Once the skiffs and ferries stop, things do tend to calm down quite a bit. 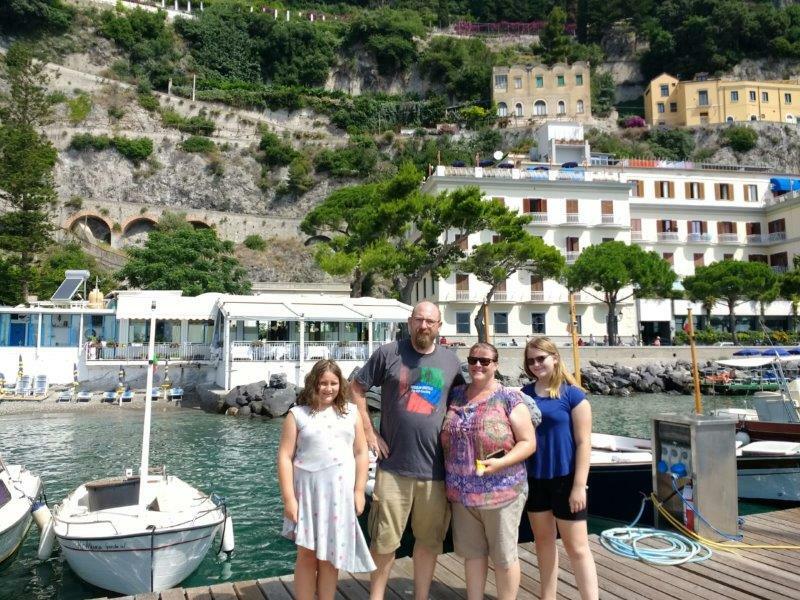 Sailing the Amalfi Coast is a COMPLETELY different experience than spending a week on the Sea of Cortez where you are surrounded by nature, no restaurants, very few people, cooking aboard, swimming and snorkeling! On my wish list is to visit the islands around Sicily! Perhaps in 2019. Would you like to hone your sailing skills, see the fantastic Aeolian islands, and eat wonderful Italian food? Get in touch with Captain Marc and let him know you’re interested. And finally, do you need to speak Italian? No… most folks speak enough English in the tourist areas, but it always helps to speak a little, and especially to joke. Italians have a great sense of humor and if you’re willing to go with the flow and understand that things don’t always function the way we are used to here in the USA, you’ll have a blast!!! Why Santana Sailing and NauticEd? Something has you curious about us, and you want to know more. You are likely asking yourself, why not go with an ASA, or US Sailing school? I’d like to tell you why NauticEd makes sense to me, and why we are a NauticEd sailing school. In the world of training and development, the standard around the globe is to blend online learning with real world skill practice. In the world of sailing and cruising instruction, this same blended methodology is used by NauticEd and has many advantages over the way things have been done, and are still being done. From the student’s point of view, for example, the great thing is that she can get an interactive lesson in the theory and practice of sailing before ever setting foot on the dock. So, rather than spending half the first day listening to the instructor explain how a sailboat sails, the student can get right to the fun of sailing and put the theory to immediate use on the water. And from the school and instructor’s point of view, the student is more fully engaged, learns to sail more quickly, and achieves a higher level of competence and confidence. That’s a win, all the way around. Get 2 Free sailing courses from NauticEd right HERE to check it out. Many ASA Schools, and at least one notable US Sailing School, promise to teach you to learn to sail and cruise in one week, often as a live aboard experience. As a US Sailing and ASA instructor, and one who has taught the week long live aboard courses for an ASA school, I’ve seen that the average person simply cannot go from non-sailor to competent and confident in that time frame. The student gets experience and a “license to learn” so to speak, but she is not going to feel ready to skipper that new 45 foot Beneteau, and if that’s all she has on her sailing resume, a charter company will require a professional captain on board. Hmmm. NauticEd’s Bareboat Charter Master rank on the other hand, is earned with 50 days of sea time, and 25 of those days as Master of the vessel - that’s exactly what the charter companies are looking for. Further, those days are verified through the online resume and logbook. At Santana Sailing, we use NauticEd’s ANSI compliant rubrics (scoring guides) to verify your level of competence for a particular rank during instruction. That’s a much higher standard and it’s the right way to get it done. In the end, it is really about competence and confidence. Your spouse, your kids, your family and friends, and of course you, all want to feel like you can handle it. Isn't that what makes it fun? You do want to know that you can trim the sails, reef down when it’s windy, navigate the shoals to anchor in a secluded cove, and confidently manage whatever comes up during your weekend at Catalina, or your week in the Caribbean, don't you? Those moments, when you’ve done just that, are some of the best in life. It’s the training you get, and the resume you build that is going to make it possible to achieve your sailing dreams, whether day sailing for fun, crossing an ocean, or chartering a catamaran in some exotic location. Helping you get the competence and confidence you need to do just that is what we do. The Sun, Fun, and Sailing in OC Meetup goes out regularly, and we fly the chute every chance we get. See the details Here. Gail is a regular and loves to trim, but here she's taking a break. Happy New Year! 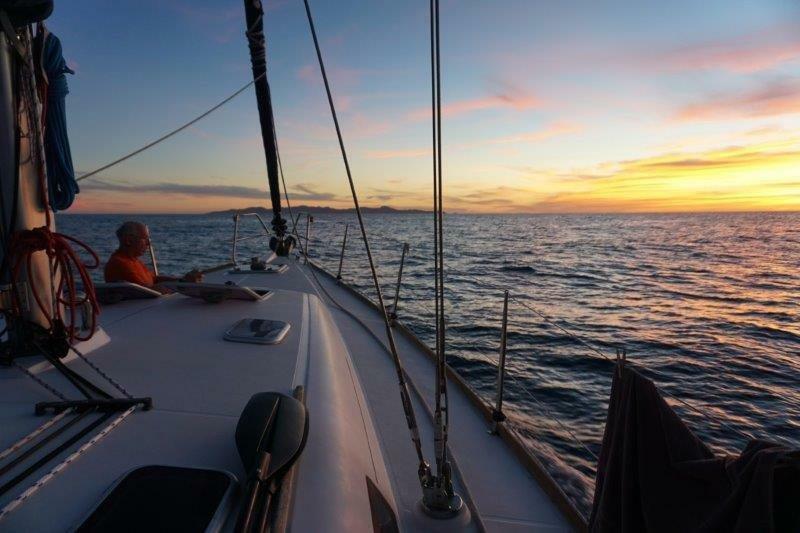 In this newsletter I have a gift for you: 2 FREE sailing courses from NauticEd (Click Here). 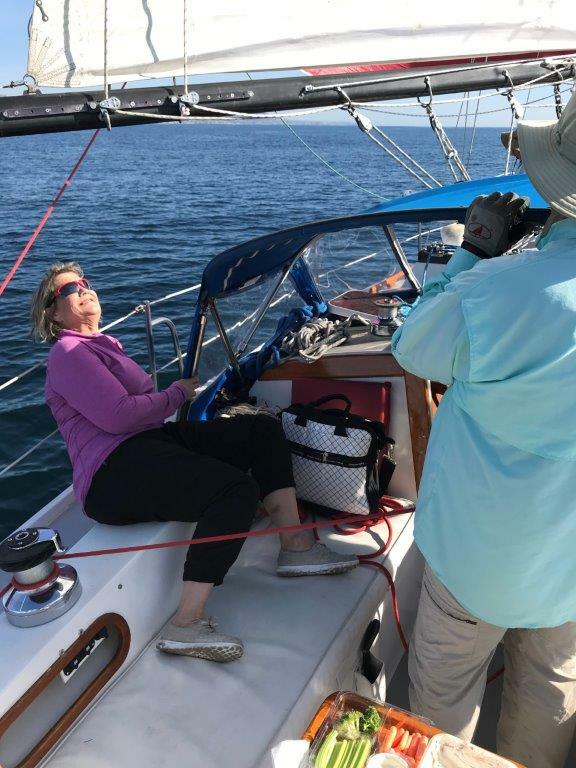 I also have a story from my Sea of Cortez trip in December, and it's in keeping with the third part of our theme for sailing adventures this year: SAIL, EXPLORE, GROW. We had to grow with a new and potentially hazardous situation, and you should know about the DeLorme inReach satellite communication system we used to handle it. We also got reliable weather forecasts without single side band, VHF radio, cellular signal or WiFi, and that's pretty darned useful. Disclaimer: I’m not being compensated in any way for writing what you’re about to read; you should know it about it though. You’re going to want this system wherever you sail and cruise, even off the Southern California coast. At Catalina and the Northern Channel Islands, you'll find that often when you are anchored out in a nice cove, there is either spotty or no cellular signal, and definitely no WiFi. I bought my inReach SE in 2015 when I started doing week-long instructional trips on the Sea of Cortez. I had WiFi at the marina in La Paz, but that ended as soon as we pulled away from the dock, and cellular coverage ended within about 7 NM. I wanted to be able to keep in touch with important people, and I wanted to have a backup rescue service available in the event our VHF radio quit working, or in case we just couldn't reach anyone in this remote area. The inReach gave me that functionality and peace of mind, and weather forecasts too. On this last trip I just did not expect how useful, and how important it might be. I just recently started using the weather forecast function, and it was unexpectedly useful for us. We were anchored at Ensenada Grande, on Isla Espiritu Santo, and I wanted to take the crew out to snorkel on the point in the morning. The weather was changing though, and we wanted to know if it was going to be too windy. The forecast was for winds around 6 knots at 9 AM, so it looked good for snorkeling. Turns out we got a late start for the snorkeling, and the wind came up after 10 AM, but it was an accurate forecast. We would have made entirely different plans if we had gotten a forecast for strong conditions. Screenshot from the inReach web page for 12/16/17. In the image above, you can see our track and where we anchored. I added the labels for the anchorage and the point we were going to snorkel using Adobe Illustrator. The really cool and useful thing is that the forecast we received was for our actual location – the GPS coordinates where we were anchored. We were a good 25+ NM from La Paz, and we'd have to see if we could tune to the cruisers' net the next day to get the regional forecast. When you can get the local forecast on the inReach on demand, you realize just how handy that is. A sample of the free forecast as it appears on the iPhone thru the Bluetooth link. 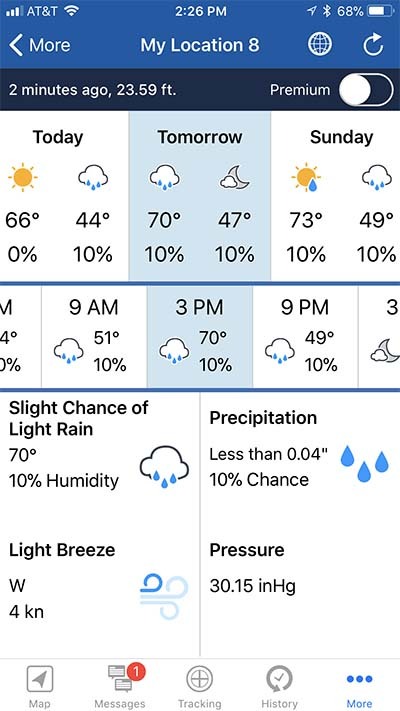 Shown is the 3 PM forecast for "Tomorrow." A more detailed forecast is available for a premium. Note to weather gurus: I know you can't see the longer term trends with this forecast, and there certainly are limitations, but it's nice to be able to see accurate local predictions of wind strength and direction. I asked Garmin tech support where the weather data comes from, and they replied via emai, "Land forecasts are Powered by Dark Sky, a leading provider of weather data around the globe. Marine forecasts are based on OCENS premium marine weather data. This situation is what the inReach is really for. One of our crew was walking in shallow water, pulling the dinghy along toward the beach, and was stung by a stingray. When she got back to the catamaran she was shaky, in pain, and in shock. Beyond first aid for the wound and treating for shock, I needed help with treating for the venom and clearly recognizing specific signs of an allergic reaction. We had no cell coverage, and I was skeptical we'd be able to reach help via VHF radio while tucked deeply back in the cove. I got on the inReach and texted my wife Chrissie back in California, asking her to research it on the web and to contact the doctor we knew in La Paz for advice. That is the important part: the ability to communicate clearly and quickly in an urgent situation (Pan Pan), can really make a difference. Even more so if it were a sinking, or a life and death situation (May Day). This is a screenshot of part of the actual conversation. I was able to ask Chrissie to look up treatment for stingray stings, and the indications of an allergic reaction. One of the things we learned through this process was that hot water helped to neutralize the venom. We wouldn't have known otherwise. We headed back for La Paz at max rpm under power, with a reefed main for the strengthening wind conditions. While underway we were able to communicate with the doctor. Once we had cellular coverage, our injured crew’s husband was able to call the doctor to confirm arrangements. When we landed at the marina, we got help from a local cruising couple, and they were off in a car to meet the doctor at the hospital. After 7 stitches and a professional medical evaluation, our crew and her family had confidence that all would be well. That was a really good outcome. I don’t have any promotional product links for you, but I’m sure you can find the inReach on the web. I use the tracking function on every trip so that I can let important people see where we are at any time of day. On my next Sea of Cortez trip in March 2018, this will come in handy so that people who are meeting us in Loreto can see our progress from La Paz, and even ping me for questions. And now, take a look at what we have coming up!!! Grenada trip, April 21-28, on the Lagoon 440 catamaran, Almost There. This is a guided sail training adventure, where you can step up your game. It'll be an amazing experience. Sail. Explore. Grow. Maneuvering Under Power – On the Water. Stay tuned for the announcement of our upcoming Maneuvering Under Power course, on the water in Newport Beach. This is the practical training component to the NauticEd online course. 2 FREE Sailing Courses from NauticEd. Check in to these online courses and you’ll begin to see how online training combined with on the water skill practice works in the sailing world. Best wishes for the New Year!